We had an early start and by 8:30 am. I had a half-price ticket (¥60 covering the Overhanging Wall and the Fort. 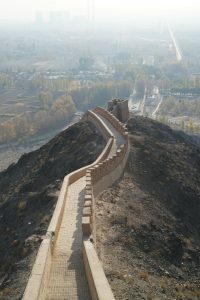 First, we climbed the famous Overhanging Great Wall at Jiayu Pass which is said to be the largest and most intact pass of the Great Wall of China, a World Heritage Property since 1987. The climb is steep but not long. Zhang Qian, Xuanzang and Marco Polo had all passed through this strategic pass during their famous journey. Anyway, this section of the wall appears fairly new and not authentic restored sections of the Ming Dynasty! I walked to the top and was disappointed to see the magnificent landscape being spoilt by pollution from nearby factories. It was hazy even on a fine day. 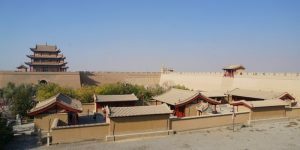 Our next destination was the Jiayuguan situated at the western end of the Ming Dynasty Great Wall. The wall here was built with rammed earth making yellow its dominant hue. 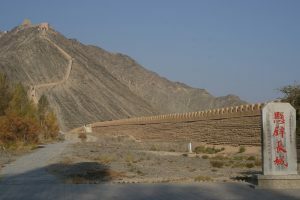 The city where the pass is located is named after the pass which was also a vital traffic fort along the Silk Road. Construction began in 1372 AD, this ancient expansive fort-city has a complex and integrated defensive system: an inner city, the central area with many buildings; an outer city and finally a moat. It has been extensively restored. 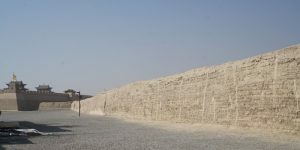 Today, the fort has a total area of 33500m2. There are 14 buildings including pavilions, gates, turrets and cannons on or along the wall. The inner city with an area of 25,000m2, is enclosed by a city wall running for 640m and reaching a height of 11m. It has two gates in the east and west. Each gate is protected by a smaller guard tower and a barbican in front forming another defensive screen for the inner city. Outside the inner city, there is another barrier forming the first defensive line of the pass – the outer city. 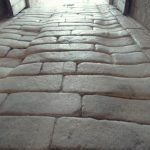 The west wall of the outer city was built with bricks making it very solid. 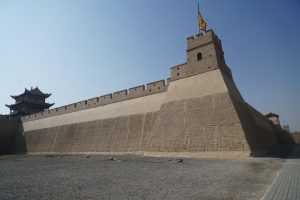 The plaque on the three-storeyed tower on the wall read “the First and Greatest Pass under Heaven” to indicate the military importance of the Pass. There is too much to see. 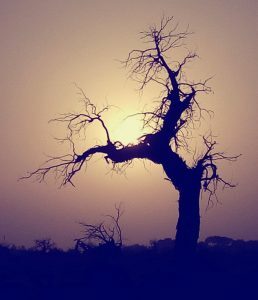 I walked fast, reached the outer city and took a picture at the First and Greatest Pass under Heaven” which is symbolic. Foreigners from the west coming to China would enter through the pass while Chinese heading west could exit. Kai paid ¥60 for a souvenir passport from Jiayuguan with a stamp on it. As we still had a long way to go, we only stayed for 90 minutes. I felt sorry that we could not visit the museum. At 11:45 am, we were back on the road. 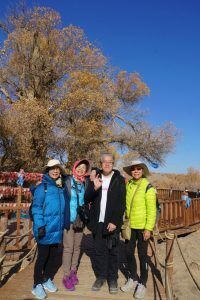 We followed S214 to our third destination, the Jinta Desert Huyanglin Scenic Area (a 4A scenic spot). Most of us got half-price tickets (¥30). Instead of taking our vehicle inside the park, we decided to pay ¥20 each for a shuttle bus service so that the driver could take a rest. This was the biggest mistake we made on this trip: we wasted our precious time waiting for the bus instead of enjoying the amazingly beautiful foliage. 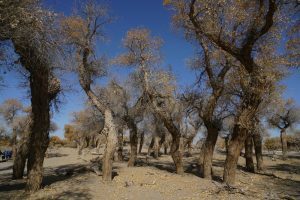 There are tens of thousands of acres of forests with trees of populus euphratica, a saline-tolerant species that grow well in desert. 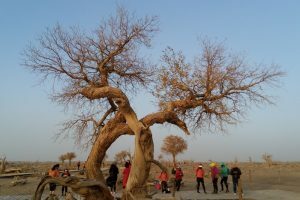 To prevent further desertification, the Chinese government has spent decades of research and hard work to plant trees in the arid regions. Gradually, man-made forests spring up like miracles in the desert. 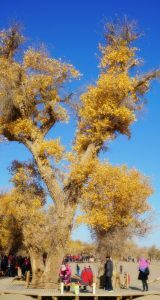 Populus euphratica 胡楊 is known for longevity and vitality: the tree can live for 3,000 years and does not fall 3,000 years after death. Its leaves turn golden in September and October after the first frost attracting tens of thousands of tourists. This expansive scenic spot consists of five areas. 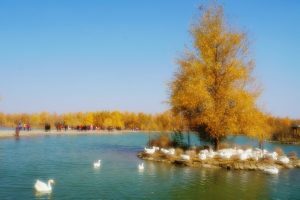 Most visitors flock to the Jinbo Lake with the trees lining the lake shore. We took a ride to the watch tower (Stop 4). 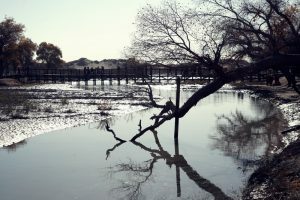 After taking a snap shot of the surrounding area, I headed to the forest and followed a broad-walk to the famous lake. There were few tourists. I lost my friends and was alone. I fully enjoyed the tranquility and atmosphere of a glorious golden autumn. 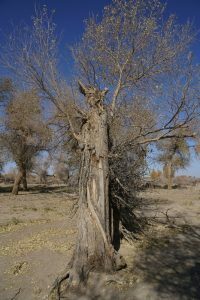 There were hundreds of dead populus euphratica in the wetland area. 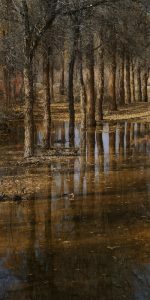 The trees with reflections turn into an open museum of sculpture and art works. I arrived at the lake at 2:30pm. 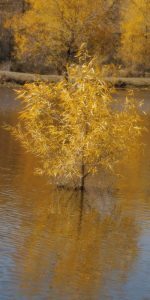 It was the most beautiful and photogenic sight I had on this trip with golden trees along a turquoise lake with a blue sky and clear reflections. I wished we could spend the whole afternoon enjoying the lake and the forest in peace. The group except Flora and Leung gathered at the lake and we managed to take the 2:40 pm bus back to the entrance. Flora and Leung got lost, missed a bus and did not reach the car park till 3:30 pm. Well, had we taken our vehicle into the park, our time would have been much better spent. Our driver was in a bad mood complaining that we were late. He did not take his lunch while we were in the park. We had not eaten and asked the driver to find a restaurant. He said there was no restaurant and we had to wait till we reached Ejina, Inner Mongolia. We continued driving along S214 and passed through an area within the Jiuquan 酒泉Satellite Launch Centre which covers a total area of 2800km2. As the centre is a military zone, no photo is allowed. We also did not get Wi-Fi with our phone. Inner Mongolia Autonomous Region (Inner Mongolia内蒙) located in the north of the country bordering Mongolia, Russia and eight provincial-level divisions namely Heilongjiang, Jilin, Liaoning, Hebei, Shanxi, Shaanxi, Ningxia and Gansu, has an area of 1.2 million km2 and a population of about 25 million. Its capital is Hohhot. Before the rise of the Mongols in the 13th century, this vast territory had been in the control between Chinese agriculturalists in the south and Xiongn, Xianbei, Khitan, Jurchen, Tujue, and nomadic Mongol of the north. Genghis Khan unified the Mongol tribes in 1206, conquered the Tangut Western Xia and the Jin dynasty in 1234. Kublai Khan, grandson of Genghis Khan established the Yuan dynasty in 1271. During Marco Polo’s legendary travel, he met Kublai Khan in Shangdu (present day Xanadu) in 1275. 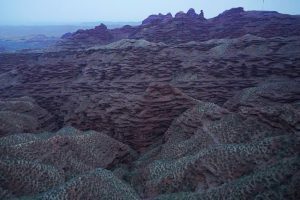 Most of Inner Mongolia is a plateau averaging around 1,200m in altitude and covered by extensive loess and sand deposits. The Yellow River cuts through north-western Inner Mongolia. The Gobi Desert occupies about a third of Inner Mongolia at the north-western part. The northern part is more forested while the natural vegetation in the south is grassland. Inner Mongolia dominates the cashmere industry and possesses large reserve of coal, iron ore and rare-earth minerals. It also produces wheat, millet, kaoling, soybeans, sugar beets and animal products. We watched a beautiful desert sunset. We were relieved when we reached our hotel in Ejina 额济纳旗 at 8:30 pm. The hotel is old-styled without facilities. But we had to pay almost ¥700 for a twin room at peak season. A rip-off! We were hungry and exhausted. After dinner, I was ready for bed and had an excellent sleep. We had a late start at 9 am and spent the morning in the Ejina Populus Euphratica Forest, one of only three existing forests of this kind in the world. It has also been listed as a geopark. I paid the full entrance fee of ¥190 and a bus ticket cost ¥40. 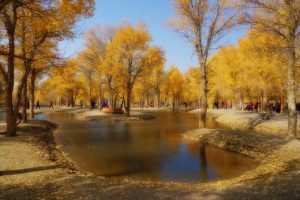 There were thousands of tourists eager to take photos of the autumn scenery. The forest has an area of about 250km2. 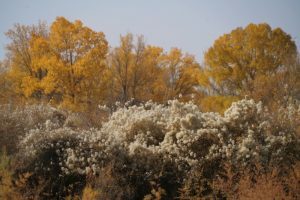 Inside the park, there are some 20 scenic spots each standing out for its special populus euphratica trees or woods, many of which have been locations for films and TV series. Today only two (No. 2 and 4) out of six attractions were open. The ticket price should therefore be reduced! From the entrance we walked through the “Taolai Woods” near Yidaoqiao with young populus euphratica with long and slender leaves like those of a willow. 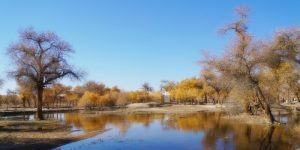 The best spot for photography is at the “Paddle Populus Euphratica” with a tree trunk falling into the river. People say it looks like a girl who is sitting by the river and dipping her feet in the water. 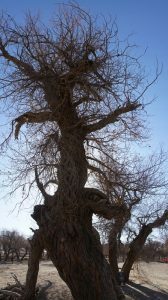 We followed the trail and saw a “Welcoming Populus Euphratica” with two large branches, looking like a person with outstretched arms to welcome guests. This tree is over 400 years old and about 17m high. 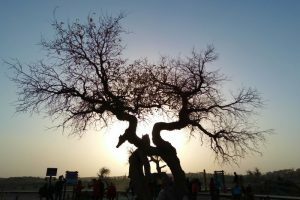 After spending an hour strolling in the forest and around a few small lakes, we hopped on the shuttle bus going to the “Hero Woods” with many over 1,000-year-old Euphrates Poplars scattering in an area of 6.7 km2. Leaves of middle-aged trees are oval and broad while the ones of old trees are similar to those of maple trees. I enjoyed my leisure walk with Bing through the wood. But my mood was spoilt by the noisy Mainland ladies who dressed in red or held out a long red shawl posing like Peggy Cheung and Zhang Ziyi in the film “Hero” directed by Zhang Yimao in 2002. Bing and I decided to hop on the shuttle bus for a ride to the end of the route. Next to Stop 8 is the desert. But a separate ticket is required. We took the bus back and tried to go back for a few photos of the trees. Unfortunately, the light was too strong. We left before 2:30 pm, walked back to the hotel and had time just for a cup of instant noodles. At 3 pm, we set off for the Black Water City Scenic Area not too far from Ejina. Again, I had to pay for a full price ¥180 and ¥20 for a shuttle bus. We went in after 3:30 pm and came out at 7 pm. But it was frustrating that all of us except Kai and Bing managed to find the Heicheng Ruins 黑城遗址(or Black Water City Ruins), an ancient fortress first built in 1032 AD and later becoming a trade centre of Tangut Empire during the Western Xia Dynasty (1038 -1227). Heicheng city which got its name from the Heishui River 黑水河was an important northern fortress on the northwest of the empire. 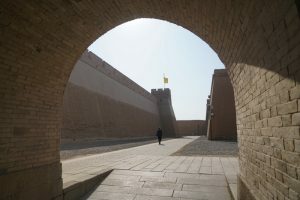 It was the largest existent fortress along the ancient Silk Road. The city continued to flourish during the Yuan Dynasty (1271-1368) but was abandoned in the Ming Dynasty (1368-1644) and left in ruins. The scenic area is expansive comprising a “Dead Euphrates Poplar Forest”, the ruins, a young poplar forest along the river and a reconstructed fortress. Unfortunately, we had not done our homework and studied the location map thoroughly before entry. 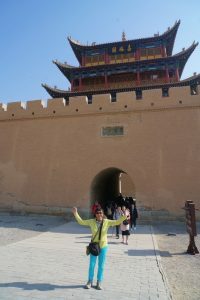 We immediately hopped on a shuttle bus at entrance which took us to a reconstructed fortress and the Heishui River. There is no location map at the bus stop. 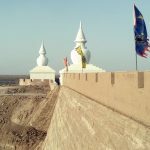 We strolled around the river bank and visited the new fortress. We were disappointed without realising we had to take another shuttle bus to the ruins which is 15km northeast of the entrance. Kai found the shuttle bus by chance. Bing ran into him and they hopped on the shuttle bus to the ruins which they describe as impressive and massive. Bing sent the group a message via WeChat about the ruins without details. As a result, none of us could make our way. I was annoyed but could only blame myself for my negligence. I am always mindful that life is short and precarious. I live and enjoy whatever I have. 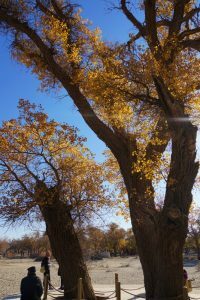 Hence, I spent almost two hours wandering aimlessly at the at the Dead Euphrates Poplar Forest, a wonder of nature. 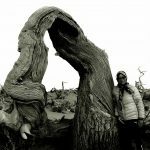 What a blessing to be able to be with the trees which had witnessed the rise and fall of the Heicheng City and are still standing majestically! 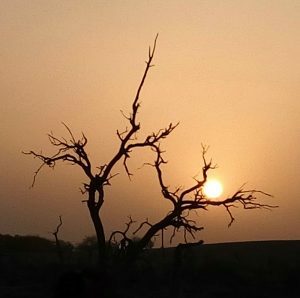 I watched sunset in a surreal and most extraordinary world of dead euphrates poplar trees. Instead of looking at man-made treasures at the ruins, I spent my time with living creatures of ancient times. What an experience! We were all on time and returned to Ejina at 7 pm. We had a feast with most delicious mutton. We had to sleep early as we would depart at 5am for sunrise. We got up at 4:30 am and set off to Juyanhai 居延海, the tail of a lake of the Heihe River, the second largest inland river in China. Originated from Qilian Mountain, the river flows through Qinghai, Gansu and Inner Mongolia provinces for over 800km. 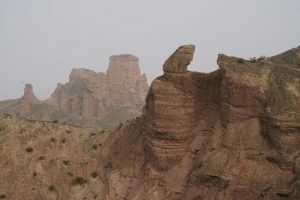 it merges into the Gobi Desert in the north-western margin of the Badain Jaran Desert 巴丹吉林沙漠. The Ejina River flows into the lake and is the main source of water supply. The lake with a long and narrow shape like a new moon, is divided into two lakes (Noel and Shun Noor). Its position can change from big to small, south to north and east to west. 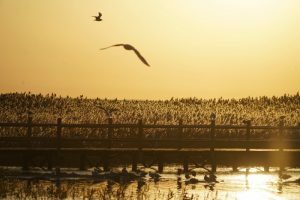 The lake, surrounded by reed, is a nature paradise with plenty of swan, geese, cranes, ducks and gulls. 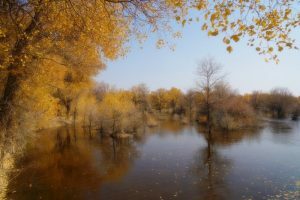 In recent years, visitors flock to Inner Mongolia to Ejina to see the Populus Euphratica Forest and attractions in the region. Sunrise at Juyanhai has been promoted as a ‘must-see’. We left at 5:10 am and arrived at the entrance of the scenic area around 6 am. I paid a full fare of ¥60 and ¥10 for shuttle bus. But we had to walk in the dark for some 20 minutes before taking a 3-minute ride to Pier 2. The sun did not rise till 7:30 am. Hundreds of people arrived early in order to secure a vantage point to take photos. 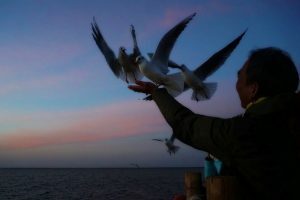 While waiting, some visitors fed the gulls and took photos. 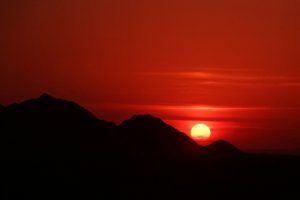 Frankly, I have watched countless beautiful sunrise in the seven continents. The sunrise today was pretty but not extraordinary by my standard. 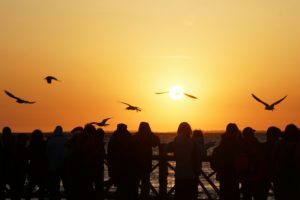 There is no need to take the shuttle bus: one can stand anyway near the lake shore to watch sunrise. 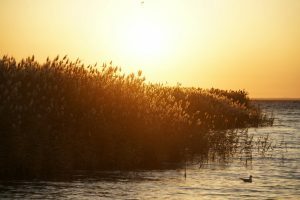 I find the desert, the reed and the rippling lake more enchanting. A stroll along the lake shore on my own away from the noisy crowd would be more memorable. We left at 8:30 am and were back in the hotel by 9:15 am. We had a long way (about 450km) to go and were ready to set off at 9:30am. Unfortunately, after driving for about 15km, the driver found the petrol station on the highway closed. At the end, he had to drive back to the town for refill. He explained the price of petrol would go up that evening. As a result, some petrol stations closed the station trying to keep their stock. How can state-owned or quasi-government petrol companies, do such a thing? We wasted about 45 minutes and did not set off till 10:30 am. We drove on S214 again with a quick lunch stop near the aviation town. A simple lunch in a dirty local restaurant cost over ¥480. It’s a rip-off! Instead of taking the toll road to Zhangye, our driver took the old road which is a short-cut. Part of the road is in poor condition with many potholes: we had a rough ride for almost an hour. Then we were back on good paved road. Shortly after 5pm, we arrived at the second stop of the day. 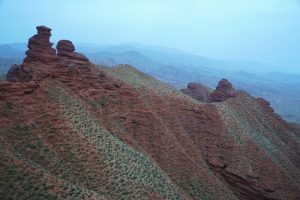 The Zhanye Pinshanhu Grand Canyon located 56km north of Zhangye, is a geopark with a total area of 150km2. 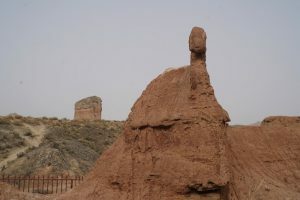 With a north-south width of 26km and an east-west length of 40km, the park consists of canyon, stone forest, gobi, snow mountain and primeval forest. The landscape is amazing and photogenic. Visitors can enjoy the scenery from both the top and below. There are four main viewing platforms with board walks on the top or along the ridges. There is also a walking path leading to the bottom of the valley. Adventurous visitors can climb. I had a concessionary fare of ¥60 and paid ¥20 for the shuttle bus. The weather was poor: cloudy and grey. The ticket office warned us that the last shuttle bus from the entrance would be at 5:30 pm and we just had an hour. The bus dropped us off at Platform 1 for a short walk along the board walk. Then it drove us to Platform 3 where we walked to Platform 4 to re-board the bus at 6:30 pm. We walked fast and only took a couple of snapshots. As usual, traditional Chinese names are given to various natural rock formations and scenery including the “nine dragons converging in the sea”, “a couple peaks”, “one-line sky”, “lucky sacred tree”, “golden toad confronting the sky”, “stone forest” etc. It must be fascinating to walk along the chasm. But time does not allow visitors entering the park after 4 pm to do so. I therefore think the park authority should lower the entrance fee to visitors after say 4:30 or 5 pm. It got dark after 6 pm. It’s a pity that we could not see the amazing colours and grandeur of the canyon. We took the last shuttle bus and got back to our bus at 7 pm. The driver made a mistake and we ended in a different hotel in the city centre. As a result, we probably wasted at least 30 minutes and did not arrive at our hotel opposite the high-speed train station till 8:30 pm. It’s brand new and cheap: we paid less than ¥300 for an elegant and comfortable twin room. But reception was inefficient and took more than 30 minutes to complete the check-in procedures. Tonight, I shared a room with Bing instead of Flora as Bing and I would spend another night in the hotel while others would leave for Xian the following day. We were tired and would prefer a simple meal in the hotel before going to bed. But there’s no restaurant and we had to take a taxi. It was raining and cold. We waited for more than 20 minutes! Luckily, we found a nice local restaurant near the night market. We ordered ten dishes and had a great farewell dinner. I had too much and went to bed after midnight with a full stomach. Not good for my health! We had a full programme in the morning before my friends heading to the airport. 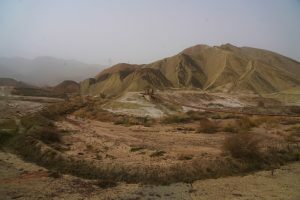 We set off at 8 am to visit the Zhangye National Geopark 張掖國家地質公園comprising two Danxia landforms丹霞地貌. 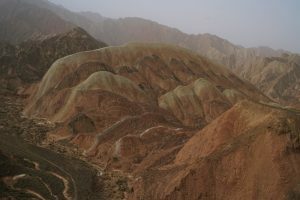 Danxia landforms are found in several provinces in southeast China and in Zhangye. “Young” landforms normally have deep, narrow valleys. 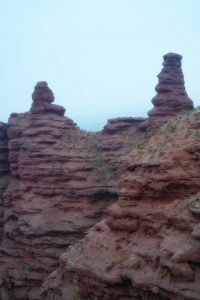 As the landform gets older, valleys would widen, isolated towers and ridges would emerge, and numerous shallow and isolated caves of various sizes and shapes would be formed. 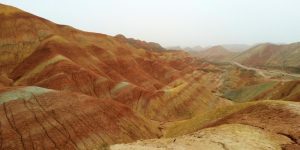 We first visited the Binguo Danxia 冰沟丹霞. Extending 5-10km from north to south and 40 km from east to west, this geopark covers an area of over 300 km2 with altitude between 1,500 and 2,550m. 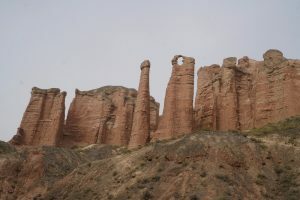 The landform includes widespread Danxia cliff, sandstone wall, stone stele, aiguilles and hills, is the best Mullion-like palace style Danxia formation in China. I paid a concessionary entrance fee of ¥20 and ¥20 for the shuttle bus. The park has two main scenic areas. We took the 9:15 am bus to the Area 1 where we hopped onto another bus heading to Area 2. 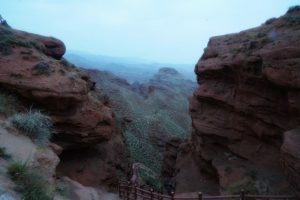 I walked up a steep staircase to the ridge for good views of the Danxia landform. Then I followed another trail to the highest platform for more fabulous 360° views. Then I took the bus back to Area 1 where the landscape is totally different. While the first area is grand with wide-open views of the splendid land form, the second area provides amazing closed-up views of the cliff, sandstone wall and towers. I walked through the bottom of the valley engulfed by over-towering cliffs. I always love views from above. I pushed myself to walk to Platform 1 which is the highest point in Area 1. I was fronted by towers and peaks on all sides. I could easily spend another hour or two exploring this fascinating area. I was lucky to catch the bus at 11:15 am and met up with the other friends at the entrance at 11:30 am. 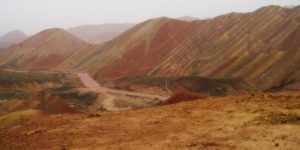 We set off to the next as well as last attraction of this trip Linze Danxia Scenic Area known for its coloured rainbow mountains. About 540 million years ago, the area was once part of the ocean. Due to tectonic plate collision, the land folded and formed mountains, and lifted above sea level. Zhangye’s Danxia was formed by the erosion of red sandstone, forming isolated peaks and steep stratified outcrops. Its special geological structure, combined with long-term desert conditions, freeze-thaw peeling and wind and water erosion have given rise to its present magnificent appearance. This famous geopark located in the northern foothills of the Qilian Mountains is most photogenic and breath-taking. 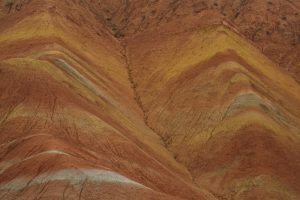 Covering an area of about 322km2, the park is a fairly land with lots of precipitous red cliffs, most of which are several hundred meters high, and multicoloured ridges or weathered strata, sometimes stretching to the horizon. The colours of red, purplish red, yellow green, greyish green and dark grey etc are awesome. As we had to leave the park by 2:30 pm, we decided to take a private 9-seater for ¥300 for two hours. My entrance ticket cost ¥28. In this scenic area, there are four major viewing areas. We only had a whirlwind visit to three viewing platforms. At the second platform near the entrance, we spent 15 minutes. One was supposed to see a sleeping beauty from the ridge at the base platform. It was a cloudy day and the colours all looked dull and colourless. I could not find a sleeping beauty. We spent 30 minutes at the third platform that affords a view of the famous ‘Seven-colour Fan’. The sky cleared a little and the mountain looked like having a faint paint with colourful palette. The huge rolling hills look very soothing with their pastel colours. The most stunning views are at the fourth viewing platform. It’s like a wonderland in a fairy tale: we were surrounded by colourful rolling hills. We walked up to the ridge running from east to west. 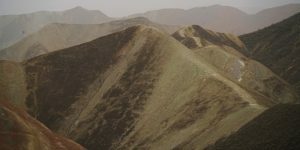 Standing on the ridge, we looked south amazed by the ‘Seven-colour Mountain’七彩山. After spending 40 minutes in this spectacular site, we had to go. After a quick lunch, our driver dropped Bing and I before 3 pm at the hotel. We said good-bye to Sunny, Joy, Flora, Leung, Kai and Miranda. They would be returning to Hong Kong after spending two nights in Xian.